Atlanta, GA – April 23, 2012 – The United Sprint Car Series presented by Goodyear Outlaw Thunder Tour and Filter charged by K&N Filters for winged sprint cars roars back into action with the USCS presented by Goodyear “Thunder in the Smokies” presented by www.Ujunkdit.com at two East Tennessee dirt tracks only twenty-six miles apart on Friday and Saturday, MAY 4th and 5th. The USCS winged outlaw style sprint cars converge on Smoky Mountain Speedway in Maryville, Tennessee on Friday, May 4th for their first-ever appearance at the 3/8 mile red clay oval. On the following night, Saturday, May 5th the series then invades the 1/3 mile red clay D-Shaped oval at 411 Motor Speedway in Seymour, Tennessee. Both races pay $2000 to win the main event with one driver able to collect $4300 including dashes and bonuses over the two-race weekend. 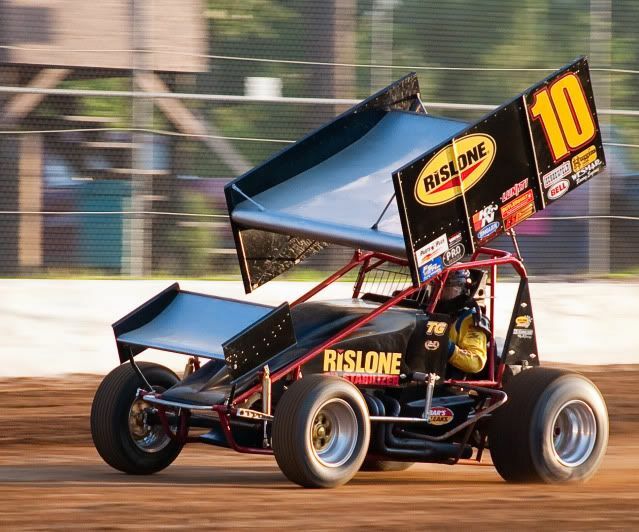 Additionally the www.RockAuto.com USCS 600 Sprint Car Series winged mini sprint cars will join the action-packed racing programs at both speedways. There main events pay $500 to win each night with a weekend sweep worth $1200 including dashes and bonuses. The popular Smoky Mountain and 411 Limited Late Models join the winged warriors of the USCS at Smoky Mountain Speedway on Friday night with a full program of racing action in that division with $1500 posted for the winner’s share at SMS. The following night, the Limited Late Models get another shot at the big bucks with another $1500 posted to the winner on Saturday night at 411 Motor Speedway as well. The Street Stock divisions joins the action at both tracks with the main event paying $500 to win each night. Smoky Mountain Speedway is located at 809 Brickmill Road, Maryville, Tennessee, 37801. The track phone number is (865) 856-8989. The 411 Motor Speedway is located at 632 Maryville Highway, Seymour, Tennessee 37865. The track phone number is (865) 257-7223. For complete directions to either track and/or more info on these two speedways please visit www.smokymountainspeedway.com orwww.411motorspeedway.net For rules and/or more information on the United Sprint Car Series and the USCS 600 Sprint Car Series or for a complete 2012 schedule of events for either series please visit www.uscsracing.com or call 770-460-7223. Smoky Mountain Speedway and 411 Motor Speedway will host a 2-day USCS Sprint Car Event “Smoky Mountain Thunder” May 4th and May 5th. you will not want to miss this 2 day Event between both tracks!! Special thanks to Mitch Gann at ujunkdit.com for Putting up sponsor money to help make this event possible!! Sprint Cars in the House May 4th!